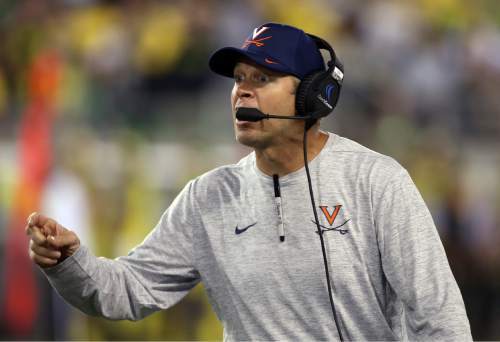 A winless debut season at Virginia is possible for former BYU head coach. 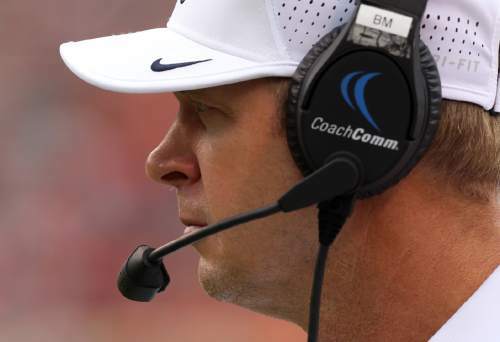 After his first game as the University of Virginia&apos;s football coach, Bronco Mendenhall showed his team a video clip of how his former BYU players cheered their defensive teammates after a third-down stop, in contrast to the Cavaliers&apos; defeatist demeanor on the sideline. Who would have imagined the Cougars&apos; loss to Utah in the 2015 Las Vegas Bowl after they trailed 35-0 becoming a teaching moment about responding to success? 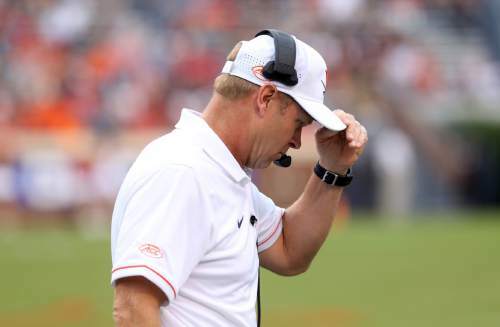 That illustrates the state of things at Virginia, where Mendenhall is tackling a tough job. The Cavaliers lost 37-20 to FCS opponent Richmond in the season opener and then trailed Oregon 30-6 at halftime before losing 44-26  which qualified as improvement, considering the opponent. "I don&apos;t know how long it&apos;s going to take," Mendenhall said during his weekly news conference. "And the mountain now is steeper and longer than I expected. But it&apos;s invigorating." That&apos;s one way of viewing it. This is where winning 99 games in 11 seasons in Provo gets you: Unless the Cavaliers beat UConn on the road Saturday, they&apos;ll face the possibility of an 0-12 season. BYU needed the jolt Kalani Sitake has provided. Mendenhall himself said so, when he took the Virginia job in December, understanding that some staleness inside and outside of the program became inevitable. And Mendenhall wanted another challenge for himself at age 50, so he&apos;s in Charlottesville, where "there is a gaining sense of optimism and confidence that is growing," he said. "But part of it is simply the time necessary for putting new habits on top of old ones. … I&apos;m not sure when the breakthrough will happen." 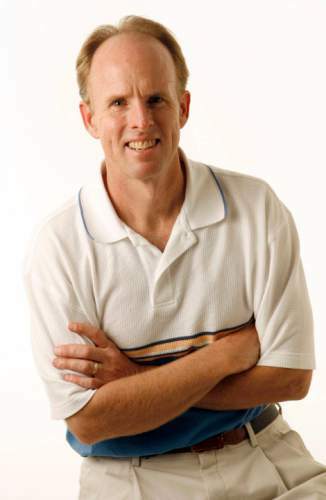 It did happen at BYU, or have people forgotten? This is unscientific, but I&apos;m struck by how quickly Mendenhall&apos;s work in Provo is being dismissed and how much glee is generated by his early struggles at Virginia. I&apos;ll say this much: He&apos;s bringing people together. Utah fans were conditioned to make fun of him as their rival, and they haven&apos;t stopped. BYU followers find satisfaction in believing they now have a better coach than the previous guy. The fun for both groups may just be starting, and Mendenhall might remain stuck on 99 career wins for a while. ESPN&apos;s Football Power Index gives the Cavaliers by far their best remaining chance of winning at UConn  about 43 percent. Beyond that, look out. 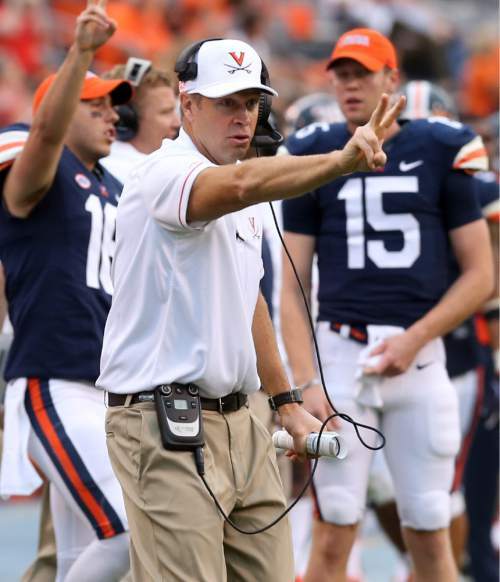 Virginia is a good fit for Mendenhall with his BYU experience, considering the school&apos;s academic standards and proper view of athletics&apos; importance on the campus, but winning always will be difficult in Charlottesville. Former coach Mike London went 14-34 in six years of Atlantic Coast Conference play. Moving up in that league will be challenging for Mendenhall and the six assistants he took from BYU  even if huge raises (including Mendenhall&apos;s $3.25 million salary) will help them absorb some of the punishment. Sitake&apos;s unofficial approval rating, meanwhile, is much higher than at any time in the second half of Mendenhall&apos;s tenure. I&apos;m not sure that&apos;s necessarily based on the results. Four years ago, when I criticized Mendenhall&apos;s choice of a two-point conversion attempt in a one-point loss at Boise, nobody disagreed. 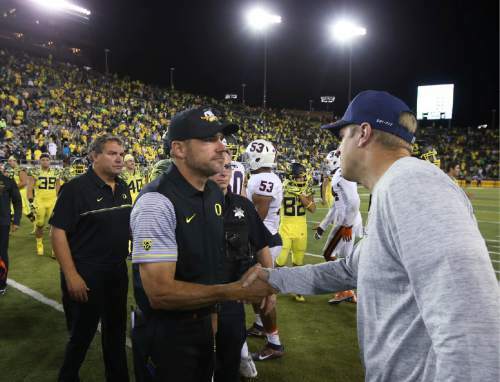 Last weekend, when I endorsed Sitake&apos;s ordering a two-point try in a one-point loss at Utah, everybody agreed. OK, I may be exaggerating the degree of approval of my arguments. Yet the overall response was unmistakeable in each case, and it captures the aura of Sitake&apos;s succeeding Mendenhall in Provo as the Cougars prepare for Saturday&apos;s home opener vs. UCLA. The circumstances of those two defeats were different, explaining my varying stances. But I&apos;m convinced the public judgment of those decisions had as much to do with who made them as anything else. Two more examples from the same games: Mendenhall celebrated BYU&apos;s goal-line stand in Boise by waving his arms like a swimmer, and the reaction was that he just looked silly. 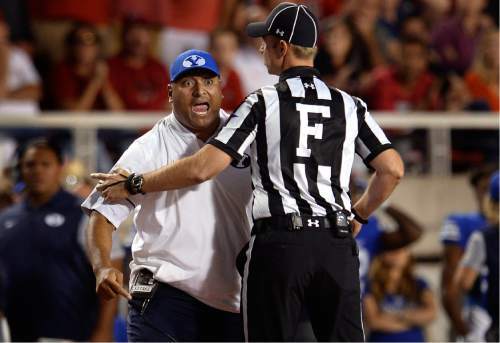 Sitake protested the targeting ejection of defensive back Kai Nacua in Salt Lake City by becoming possibly the first BYU coach ever to receive a 15-yard penalty, and his expression of emotion was widely applauded. In any case, each coach&apos;s future will be fascinating to watch as it plays out. Mendenhall underestimated what he was getting into at Virginia. This challenge is not as simple as BYU&apos;s overcoming three losing seasons and a 1-3 start in 2005, after he replaced Gary Crowton. Yet even after two weeks of discouraging evidence, Mendenhall believes he can build a consistent winner. "And I know what that looks like," he said. "I know what it feels like, and I can see it." He also said, "I see the discrepancy between that and how we&apos;re currently playing."